Ever since visiting Snow Tree for dinner with friends, I’ve harboured the suspicion that it would make a better a lunch place. Boxing Day is the time to find out, especially with Bennie still being in bed and playing Maximum Sloth to the max. Footscray Central is, of course fully open and in working order – as it was on Christmas Day. The full menu is available but I choose from the lunch deals list. 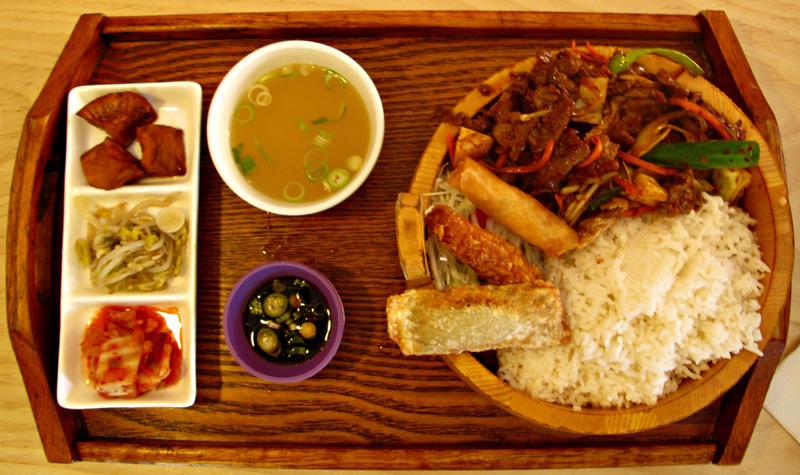 My spicy beef with rice, miso soup and three side dishes costs a very handy $9.90. 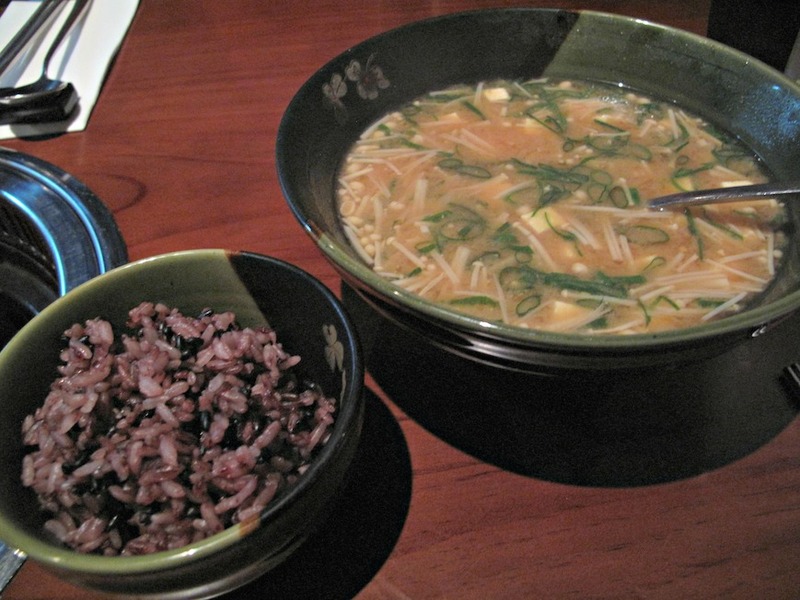 The miso soup is very pale and tasteless. 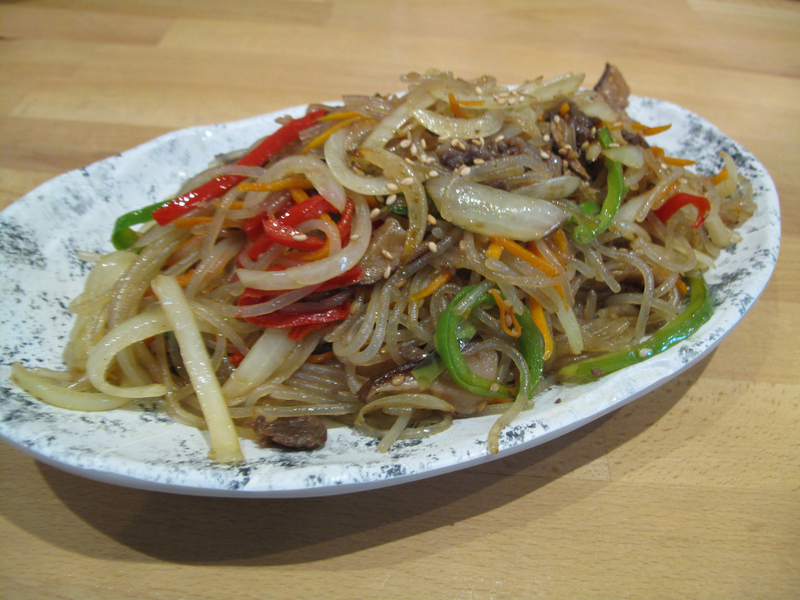 But the side dishes – bean sprouts, kimchi and three chunk of tender, tasty sweet potato – are fine. With the rice come three more bits and pieces, deep fried and unannounced. My spring roll is hot and rather nice but the crumbed item could be prawn or seafood extender. The third of the trio is a flat tube that appears to filled with mince – and perhaps potato? Under the fried goodies is some mayo-dressed sliced fresh cabbage with a couple of bits of pickled ginger that goes good with the plentiful beef. 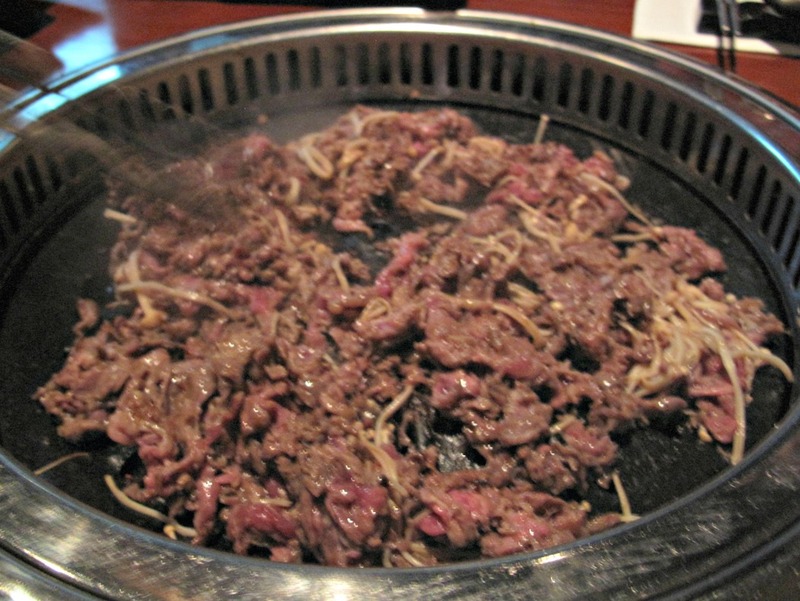 The beef – also with cabbage, as well as carrot and other foliage – is very good indeed. But it is very spicy. So … not a masterwork of lunch by any means. 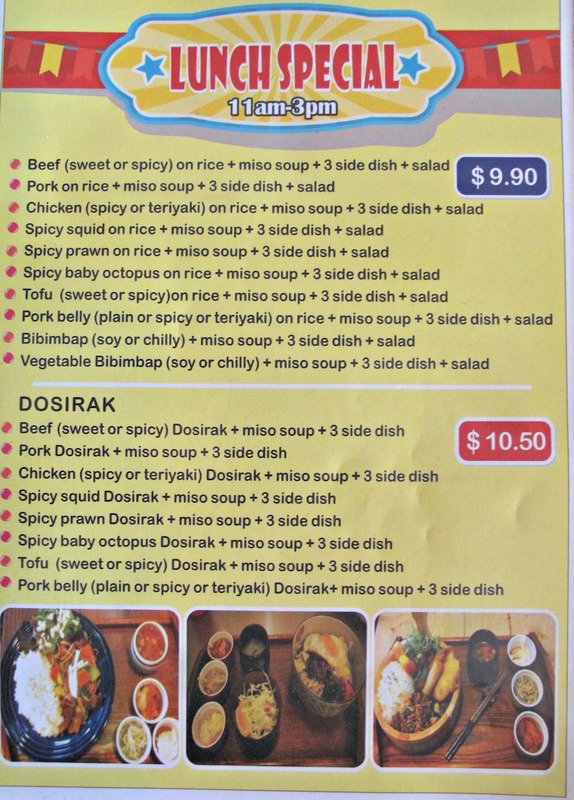 But for $10, a nice option to the many Vietnamese, Indian and other offerings at this location. 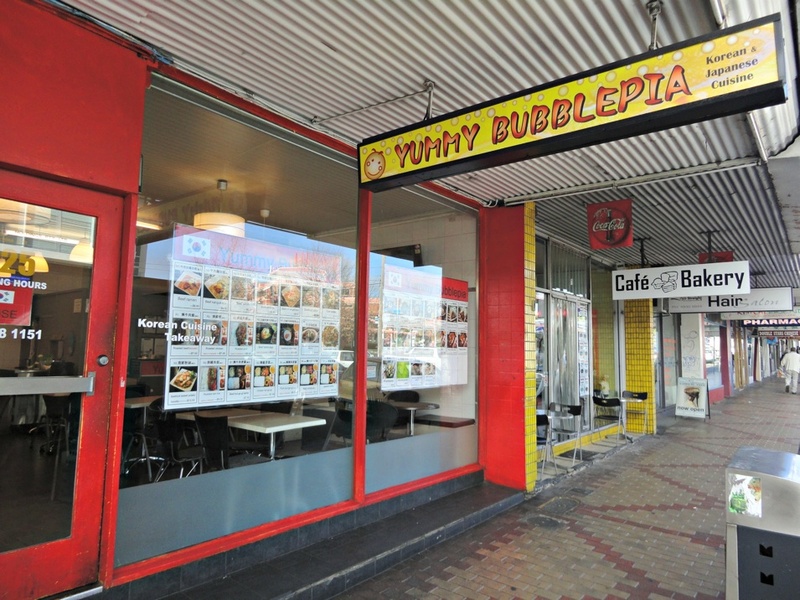 It’s clear that western suburbs have bought massively into Melbourne’s mania for burgers. The fried chicken thing isn’t quite as manic and our western neighbourhoods have mostly not risen to it charms. There’s invariably fried chook on hand at charcoal chicken shops, such as the newish Manok, but it often seems like an after-thought. We are never tempted. 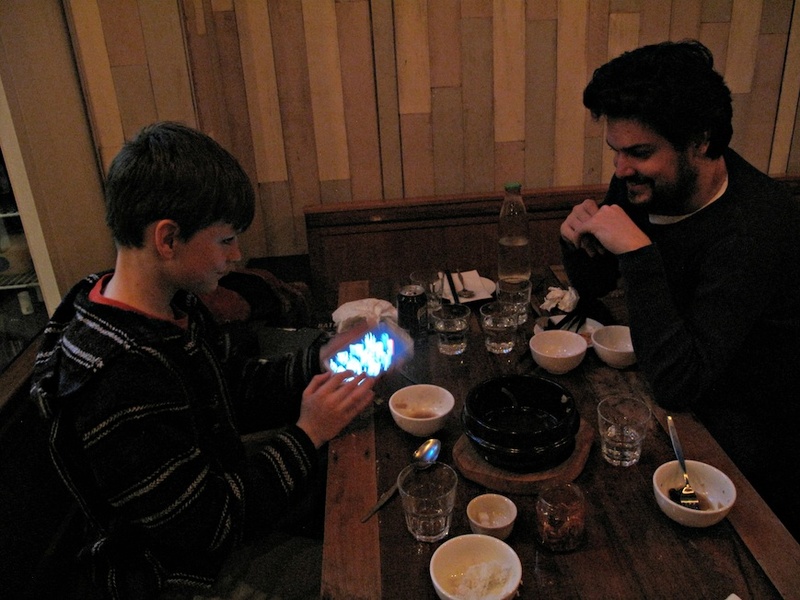 There’s fried poultry at westside Korean places such as Frying Colours and Snow Tree. 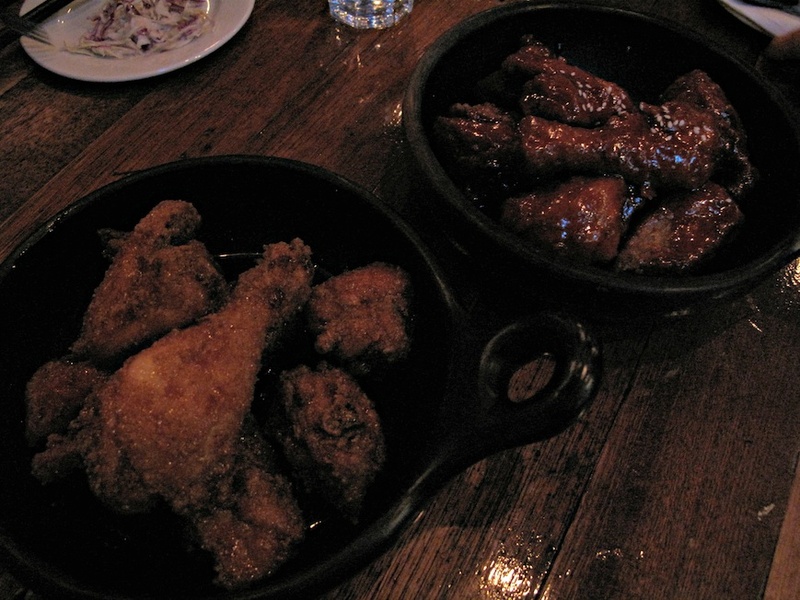 But as for any joints specialising in fried chicken of the American, or southern American, tradition … well, nope. Not so far as we know. 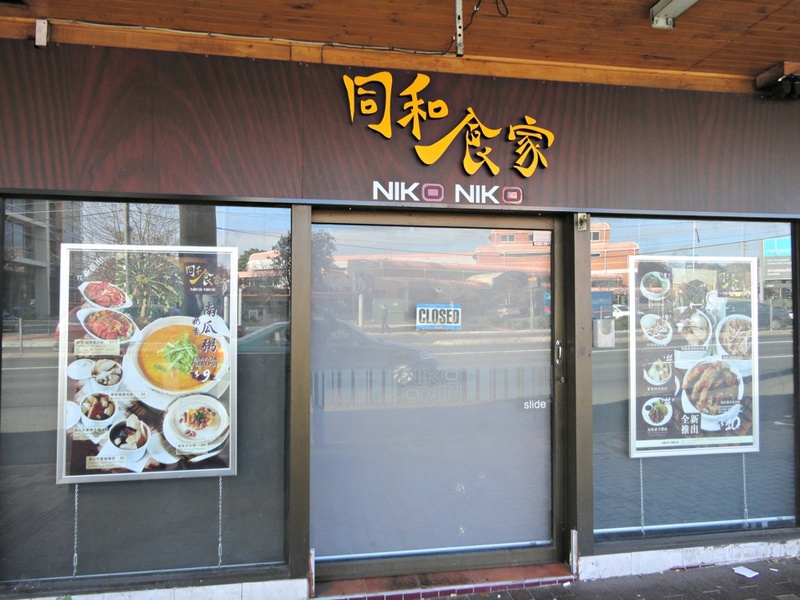 Nene is Korean, too, but we wonder on the drive to it if maybe it’ll constitute a western suburbs fried chicken hot-spot. The utter folly of going to Highpoint on a 40-degree weekend day less than a week before Christmas proves to be of pleasingly little consequence. The parking situation is intense. But once we’re inside, things in general and all the people are surprisingly cool and civilised. The Nene menu comes with so many variables, it takes us a while to work out what we think will work for us. 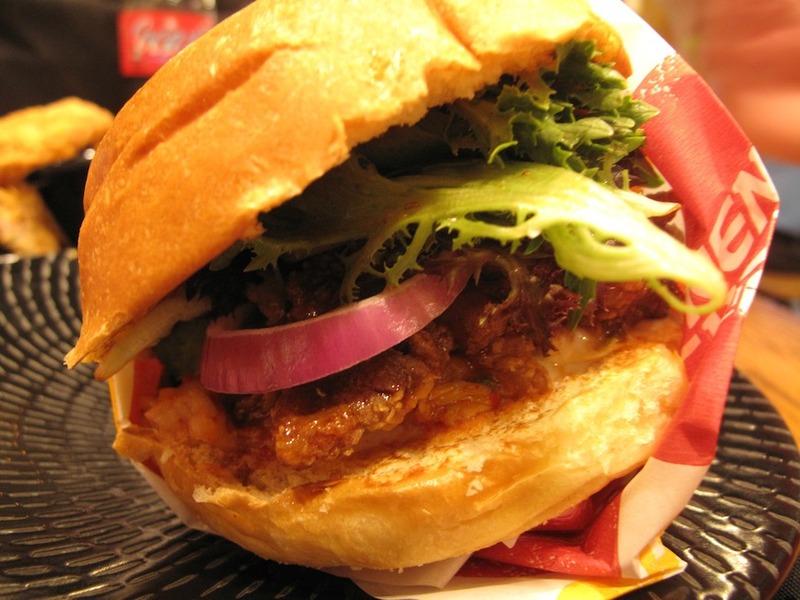 Kimchi chicken burger (9.95 – on a milk bun with salad, onion, dressing and kimchi with bulgogi sauce. 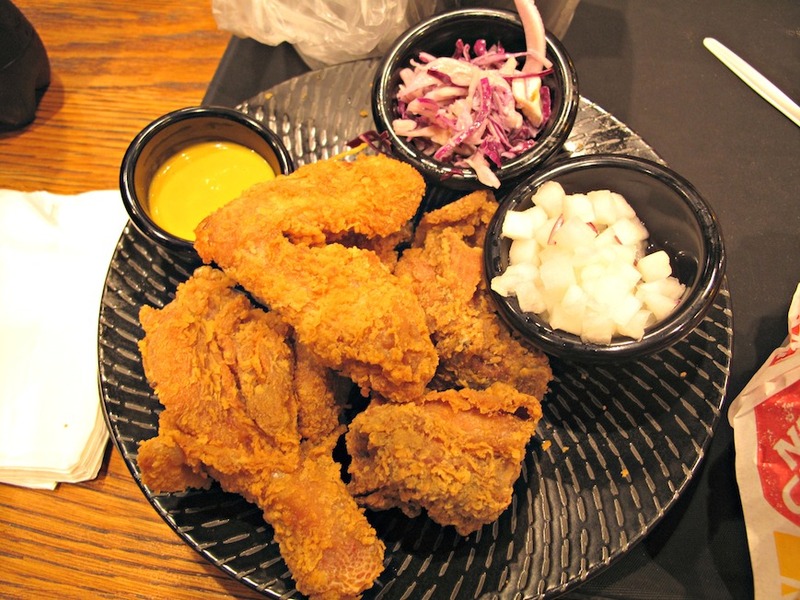 Regular original fried chicken ($10.94) – four pieces with coleslaw and pickled radish; upsized ($4.95) with chips and a drink. 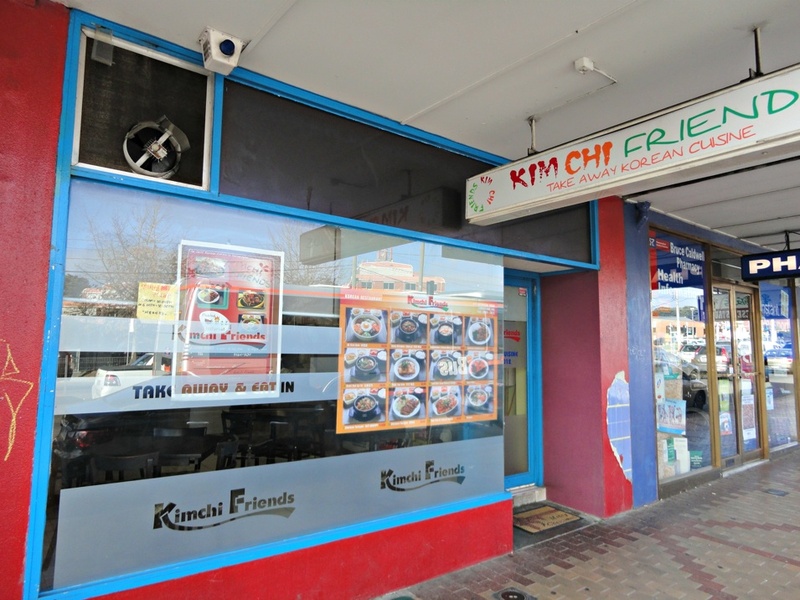 This all pans out to $29.95 for a satisfactorily sized meal for Bennie and I.
Bennie’s kimchi burger is probably our repast’s highlight – it’s a refreshing change from the many kinds of beef and chook burgers we’ve had this year. He gives it seven out of 10. The chicken turns out to be five pieces rather than four – though it must be stated these are very small pieces. It’s good and non-greasy without being in any way notable. Despite the small sizes, I am happy for Bennie to have a couple. His burger was good but it lasted all of a minute. 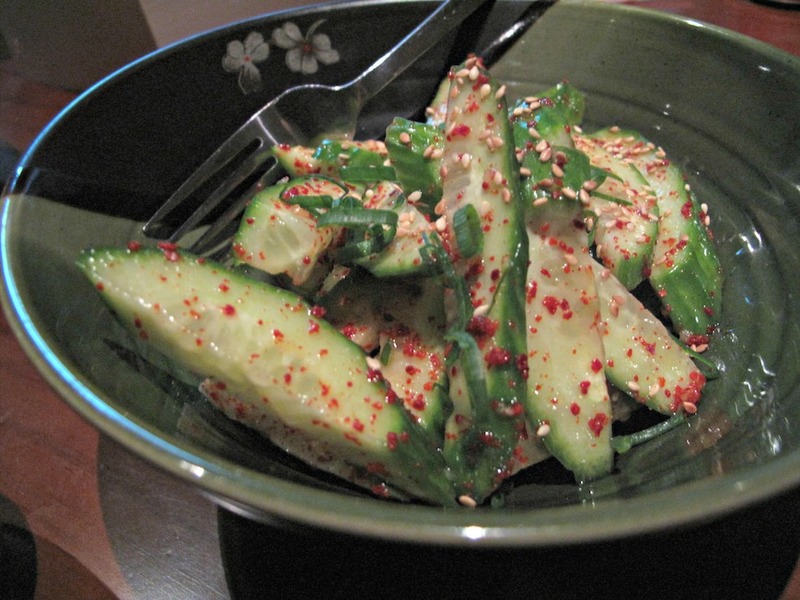 The cubed and sweetly pickled radish is nice; the coleslaw is rubbish – dry and tasteless. The chips are fine and there’s plenty for both of us. 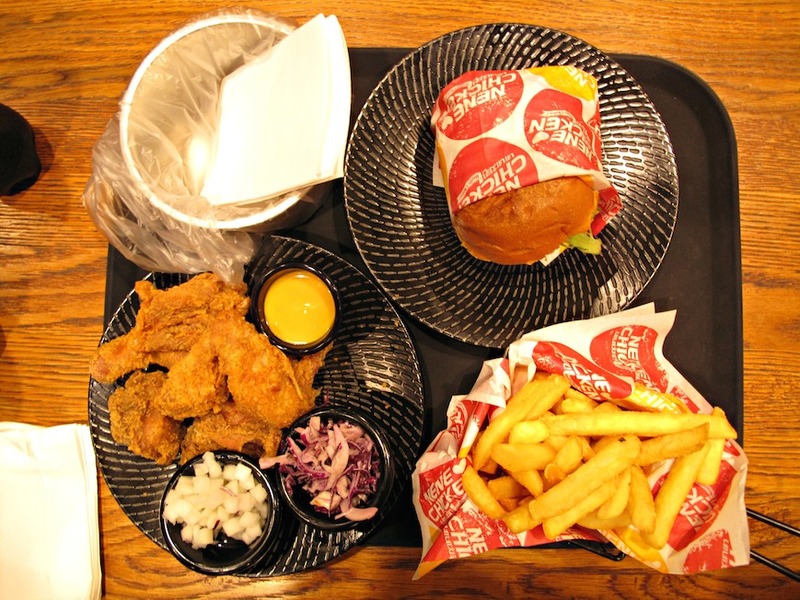 Nene Chicken strikes us as being just OK – and a long way short of fried chicken nirvana. And there are several better options close by in the new Highpoint food precinct. 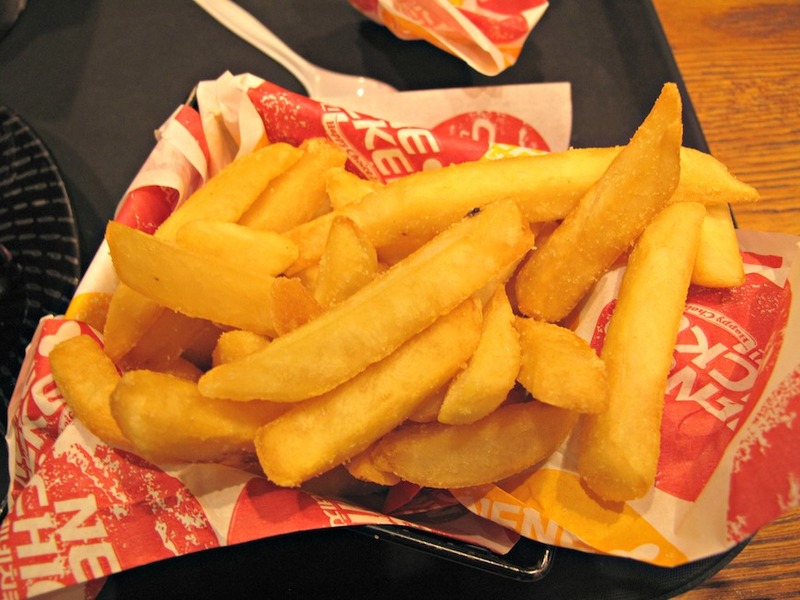 But it’s still better than the usual Kind of fried chicken grease-fests Found at such shopping Centres. Consider The Sauce is enjoying a splendid year – but it’s not one that is turning out as expected. At its start, I envisaged much activity of the CTS Feast variety. To date, however, there has been a single Feast event. Attempts to get others up and running have failed to come to fruition. I’m OK with that – if such things are not to be, pushing harder doesn’t seem to help. 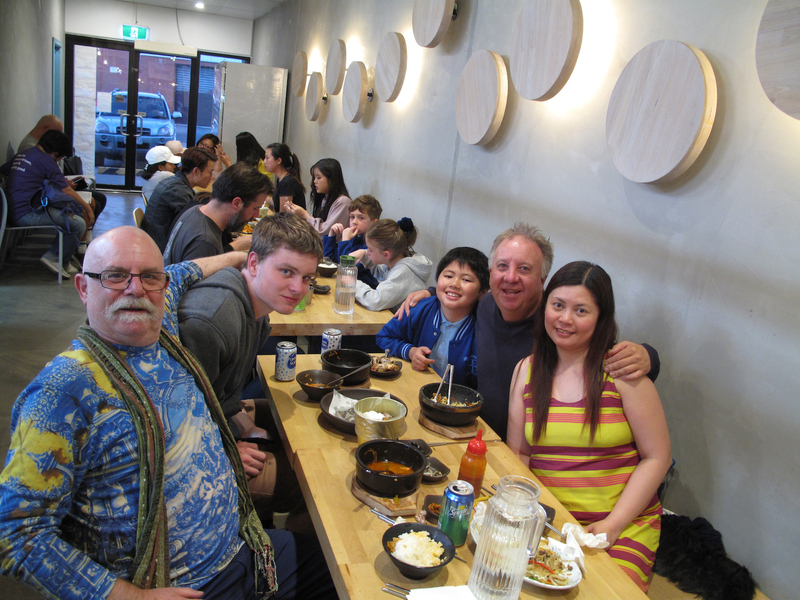 In the meantime, Bennie and I – with help from a variety of very fine foodie pals – have simply continued to explore the western suburbs with glee. That relaxed approach seems to engender it own rewards in terms of interesting approaches that lob into the CTS email inbox. One such a few months back came from Moonee Valley Council – regarding a project in which CTS is very happy to have become involved. So … this post is the first of six that will appear in the next half-year or so sponsored by Moonee Valley Council. Long-time readers will know by now – and new readers can be assured – that our participation has only been made possible by being free to choose freely the six eateries to be written about and by having complete freedom to say whatever we please, good or bad. In other words … it’s business as usual here at CTS. The stretch of Mount Alexander Road heading uphill to Puckle Street in Moonee Ponds can come across as a closed shop by day. By night, by contrast and strictly thinking of food, it becomes a good deal more appealing. 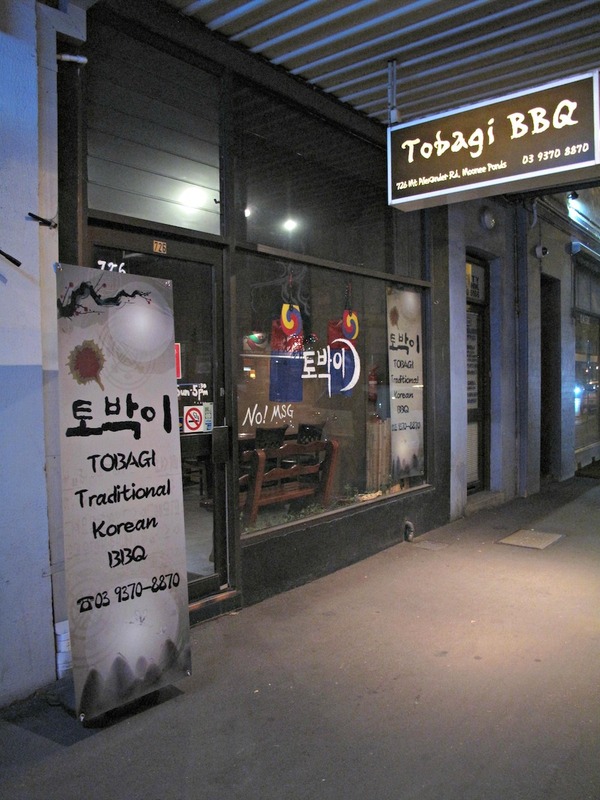 As Bennie and I wander down one side of the road and up the other, we ponder quite a nice range of restaurants and cuisines before ending up pretty much where we started, thence to enter Tobagi BBQ, a Korean joint we’ve had on our “to do” list for a long time. 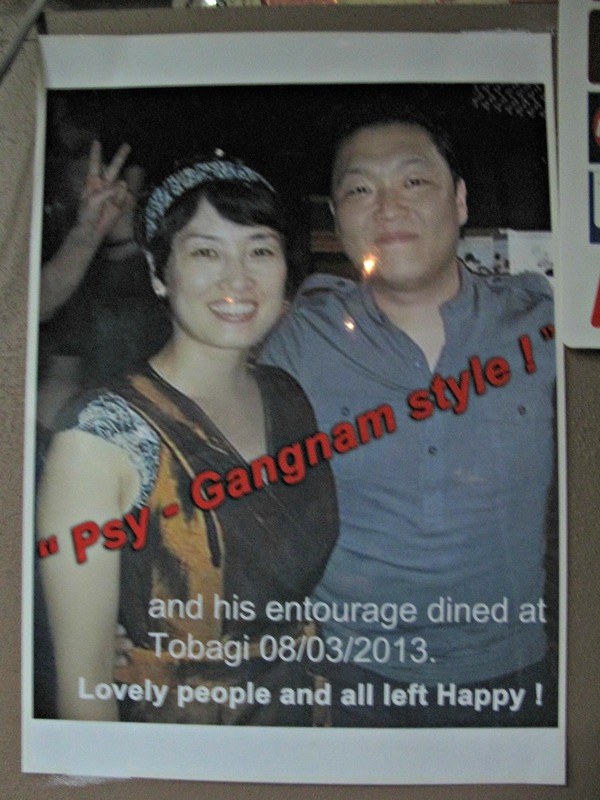 We end up being ever so happy we step through the Tobagi door, as we enjoy good Korean food of a homespun sort we’ve not come across before, cooked and served with panache. The place is rather plain, if you look closely, but the clever use of many browns creates a warm and inviting atmosphere. 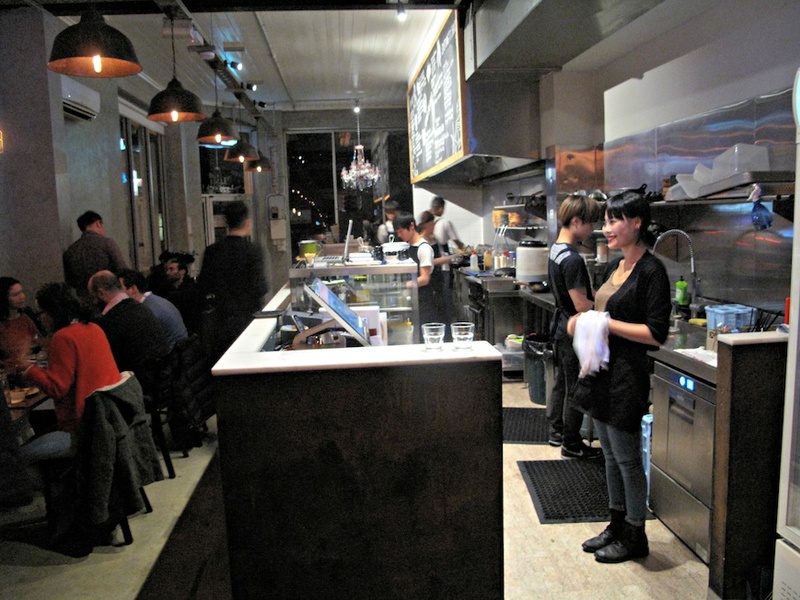 At first, on a mid-week night, we’re the only customers so enjoy the exclusive and friendly attention of both Elle and Jiweon, while the latter’s dad, Gerry, is in the kitchen. Our first dish, vegetable dumplings ($8), doesn’t augur well for a fulfilling or filling evening. 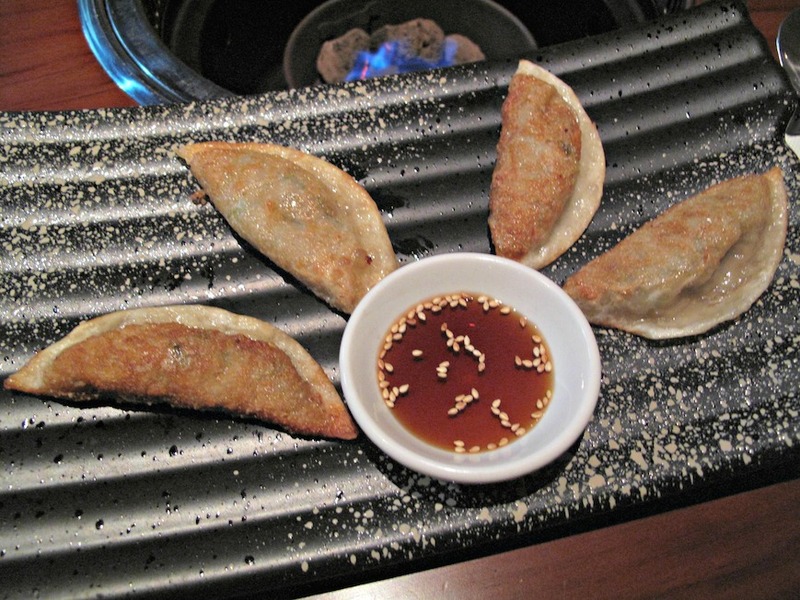 The dumplings are OK, with mushy fillings that are very garlicky, but the serve size seems on the parsimonious side. 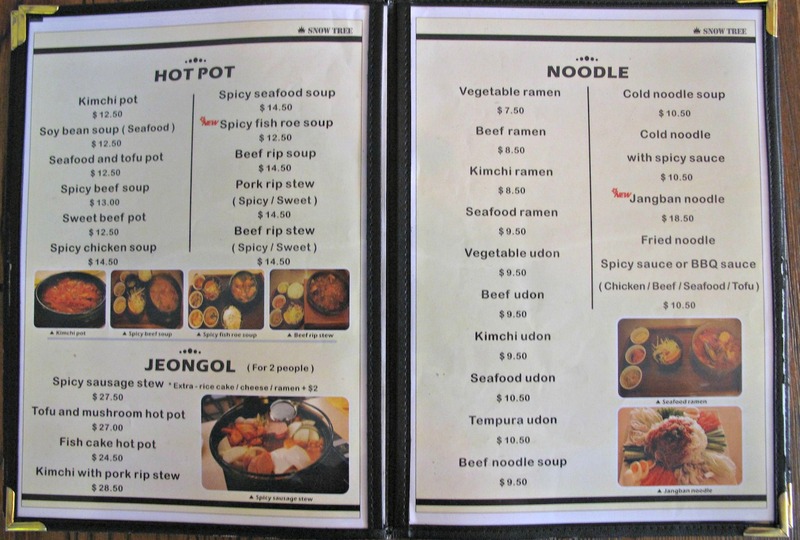 The arrival of “denjang soup” ($10) is much reassuring. 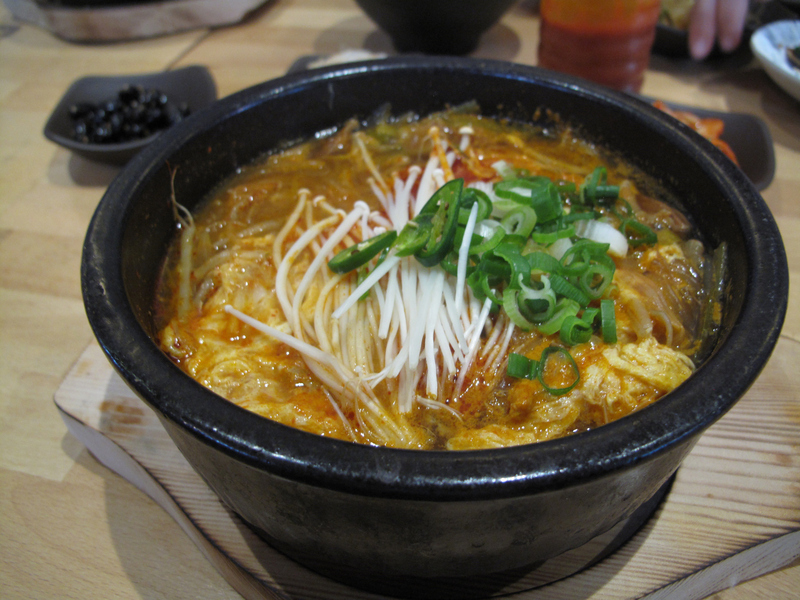 A big, very fine bowl of basic miso soup is studded with heaps of tofu and enoki mushrooms. There’s plenty enough for Bennie and I to share, though as with our mains the mix of white/black rise seems superfluous to our mutual mindset and appetite. I have friends for whom the idea of paying for kimchi is anathema. Me, I’ve got no problem with it in an Australian setting, particularly when $4 gets us this lovely, generous bowl of fresh, zingy and only-lightly-pickled cucumber. 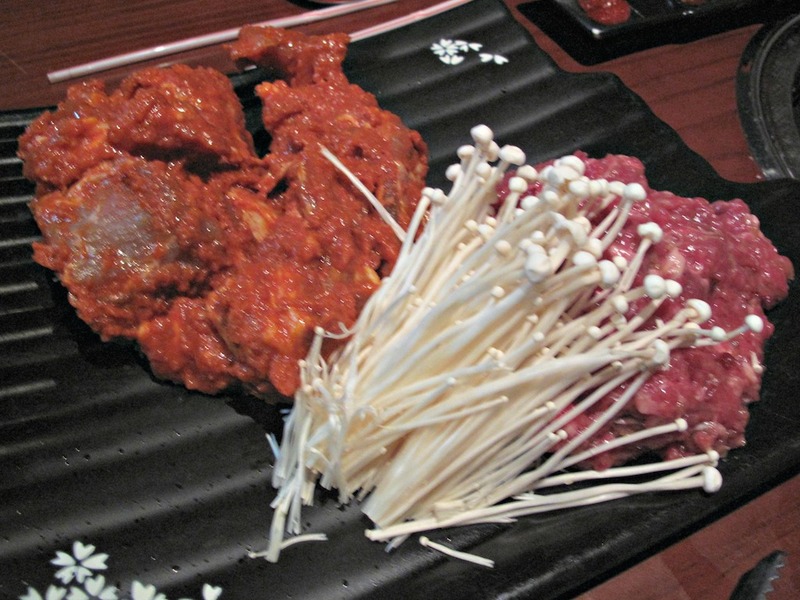 Then it’s on to our mains – for which we throw caution, both food and financial, to the wind by going big on meat with beef bulgogi ($25), of thinly sliced and marinated beef with enoki mushies, and pork galbi ($29), of free-range pork ribs marinated in chilli paste and sesame oil. 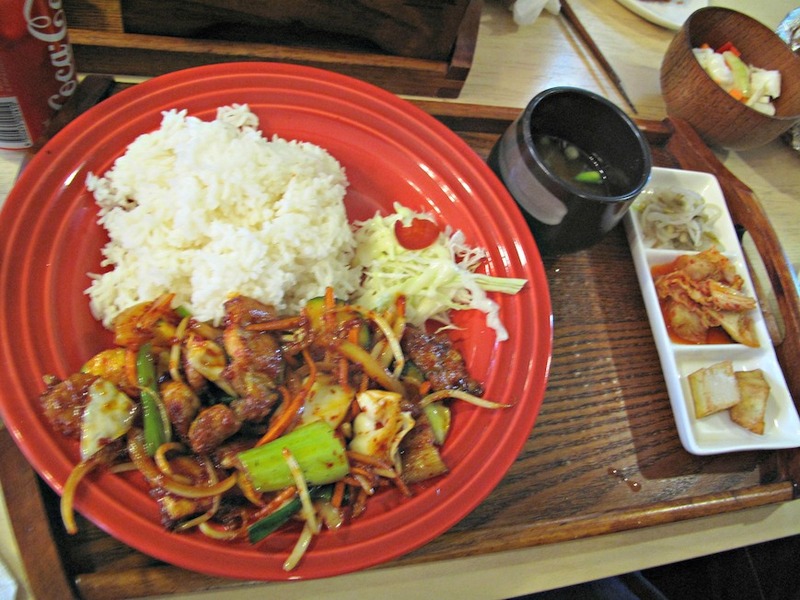 To go with our mains, we are provided with three sauces – sesame oil/salt, miso paste and chilli paste, along with lettuce leaves and two serve of the same rice ($3 each). 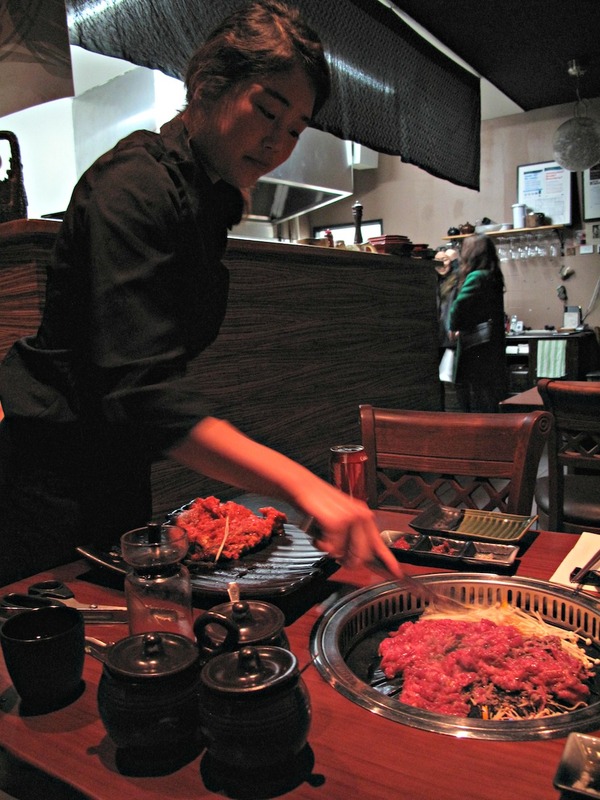 It’s at this point in our evening that Jiweon really comes into her own by deftly barbecuing our meats at our table. We start in on the beef and enokis at the medium-rare stage – and it tastes very, very nice, with great texture and BBQ flavour. We eat some with the nearby sauces. We eat some rolled up in the butter lettuce leaves, as instructed. We eat some just making it up as we go. The pork proves even more demanding of Jiweon’s time. She barbecues the big, handsome chunk of meat whole for a while before cutting the meat from the bones with scissors and continuing the cooking. In the end, we are left with heaps of smaller chunks each and a nice, meaty bone to gnaw on at the end. The meat is an interesting contrast to all the US-style barbecue we’ve indulged in this year. 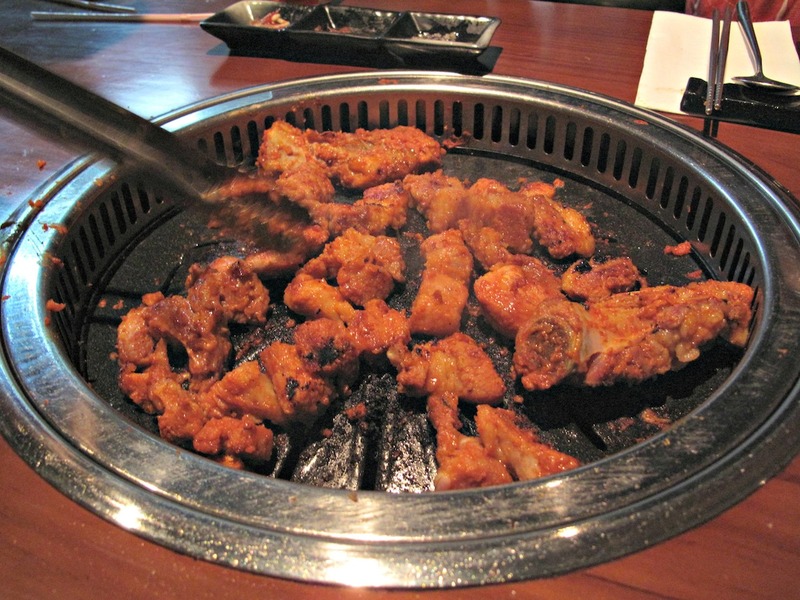 Here, the pork rib meat is quite chewy, very tasty and not as spicy as seems might be the case. We’ve had a beaut meal and love the people here. It’s a meal, though, that has stretched the definition of “cheap eats”. But we’re happy with the quality and quantity of what we’ve been served. We reckon it’s all been good value for money. Truth is, we could’ve got away with paying less by the simple, prudent moves of not ordering rice we didn’t need and two cans of soft drink where water would do! 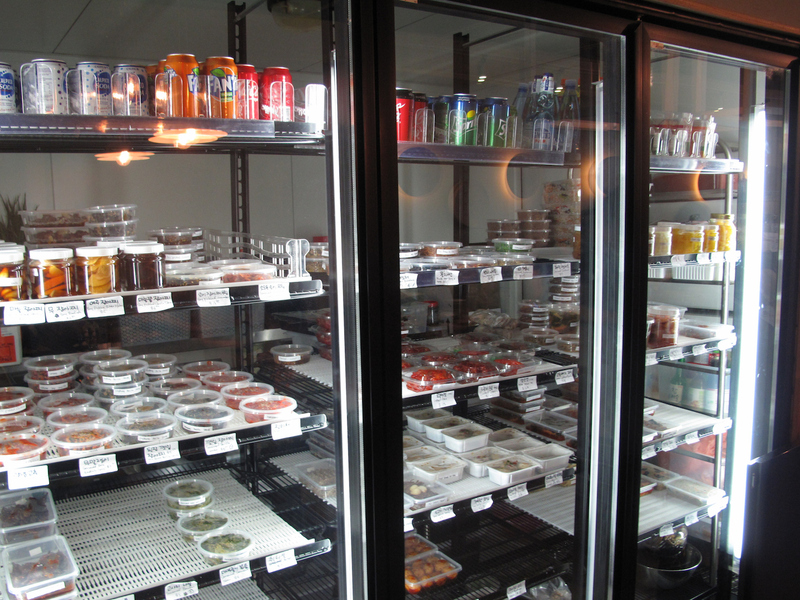 Consider The Sauce has been to Snow Tree once before when it was mostly a waffle/sweets place. In the ensuing months I have been somewhat aware that the place has been evolving. 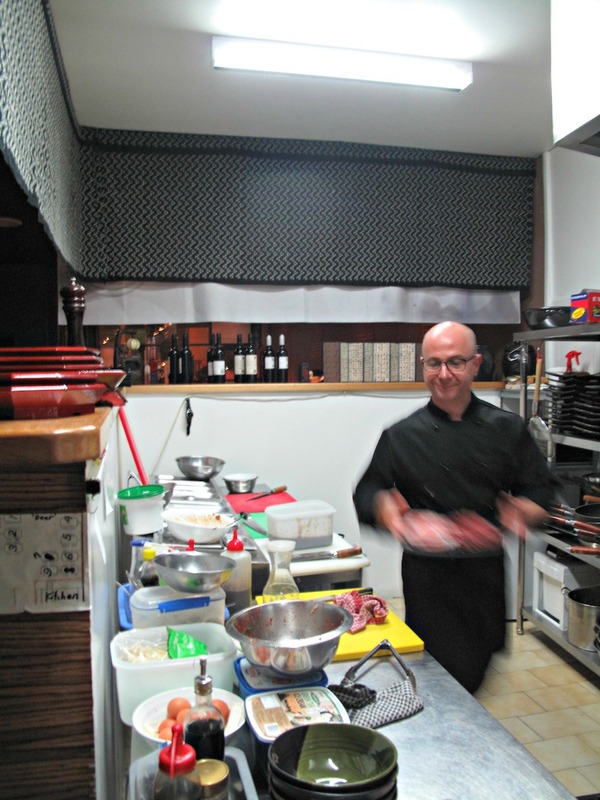 But it was only very recently that I noted that it now has a much more fetching interior and a much-extended menu. 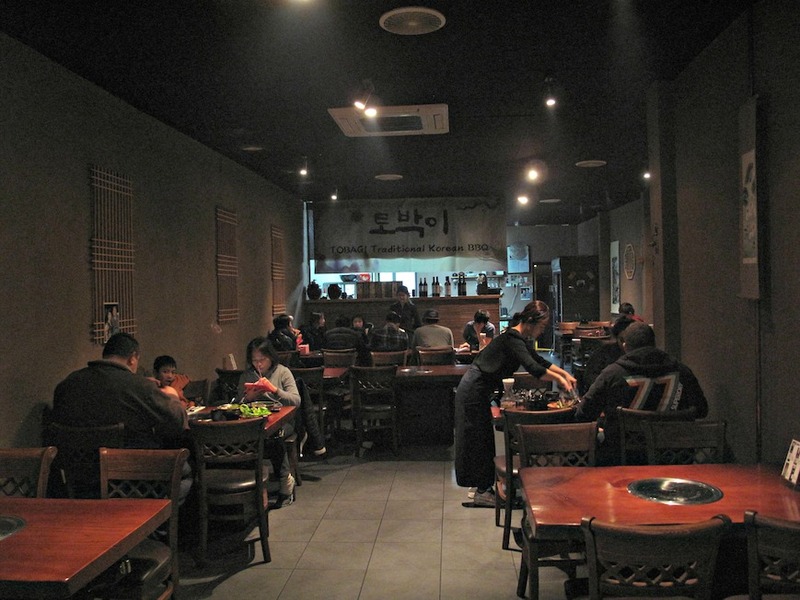 Snow Tree has become a full-on Korean restaurant! So it is that the same Team CTS of four rocks up for a feed. Fried chicken is very much on our minds. So at first we are shattered when we discover there is a big red cross drawn right through the fried chook section of the menu proper. No problem – it’s all on its own laminated card. 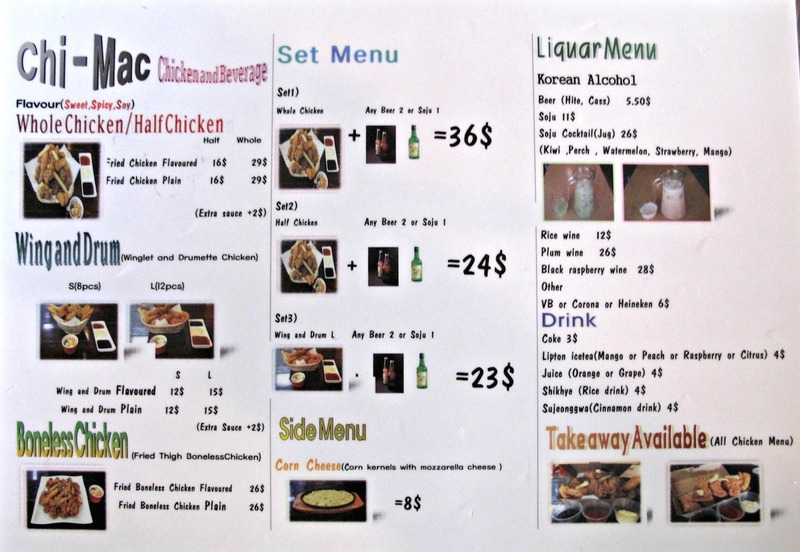 But at Snow Tree, it has to be said, the fried chook list, the lunch menu and the menu proper are difficult to navigate, with a confusing range of “sets” and options. Hard to know just how to do it for a group of four. We settle on a whole chook to share and a main with condiments each. Yep, we’re in over-order territory but not by much. One of our mains is forgotten, but the boo-boo turnaround is admirably swift and in no way detracts from our dinner enjoyment. Our whole chicken costs $29. It comes with the requested “spicy” sauce and is festooned with chips. 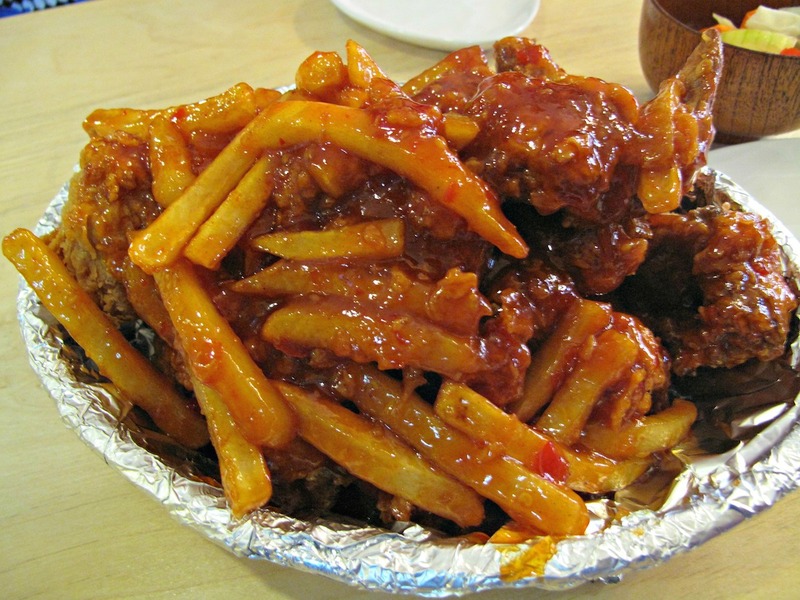 Korean fried chicken has so rapidly become a bit of a craze that there seems to be heap of folks – bloggers and others – who are experts. So I simply do not know if the chips and the masses of sticky sauce are traditional, normal or even acceptable. For me, the chips seem redundant. 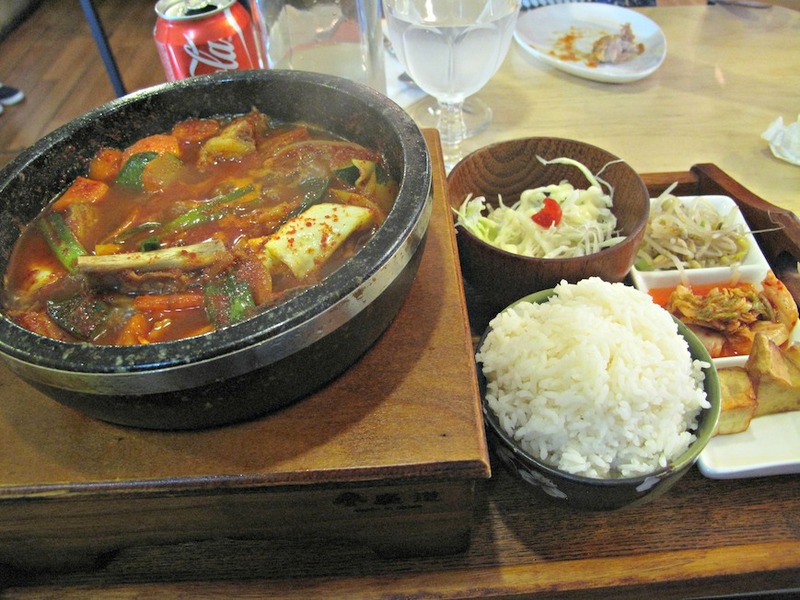 The sauce is spicy but makes for a supremely sticky – but not necessarily unenjoyable – eating experience. My spicy beef “rip” stew ($14.50) is a bit of a mixed bag. 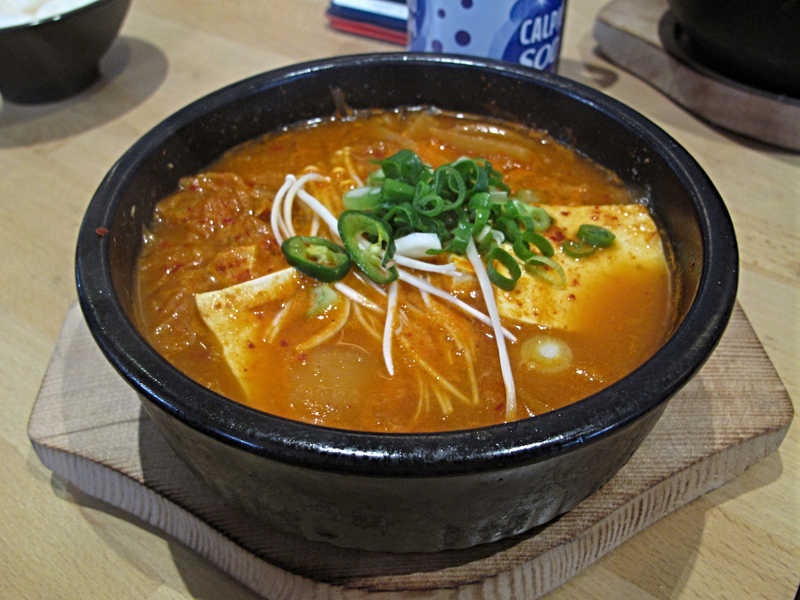 The gravy/soup is not terrifically spicy but has a tremendous depth of flavour. I love the way it works with the vegetables and some rice. There’s heaps of beef rib bits with sizable meat chunks (and fat). But the meat itself is chewy to the point of closing in on inedible. 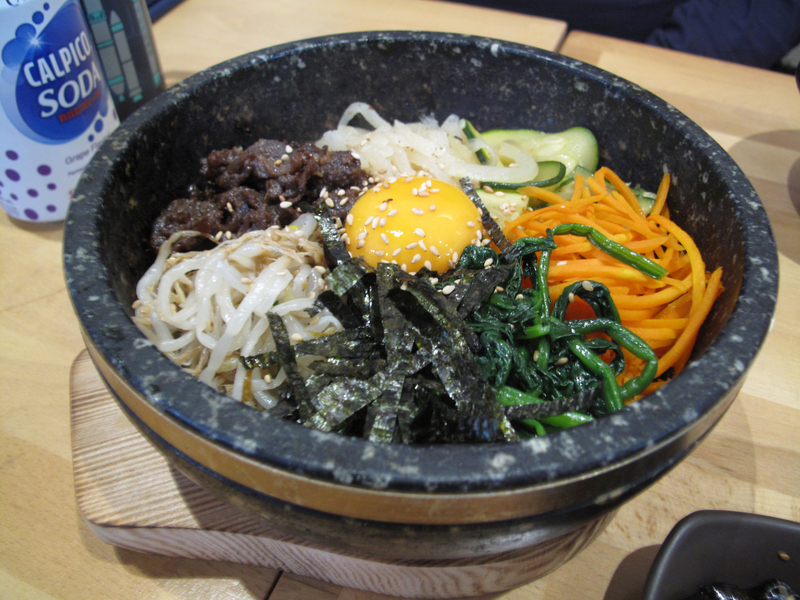 Bennie and Eliza both enjoy their “stone” bibimbap ($12), and I note with some envy that the rice bottom of Bennie’s dish is suitably brown and crunchy. Josh goes for the spicy pork belly on rice ($10.50) and I hear no complaints from him. The kimchee, slaw, bean sprouts and roast potato cubes (we think that’s what they are) that accompany all our dishes are OK without evincing much finesse. The above-noted forgotten dish aside, the service is good and the wait times about right for the dishes we have ordered. 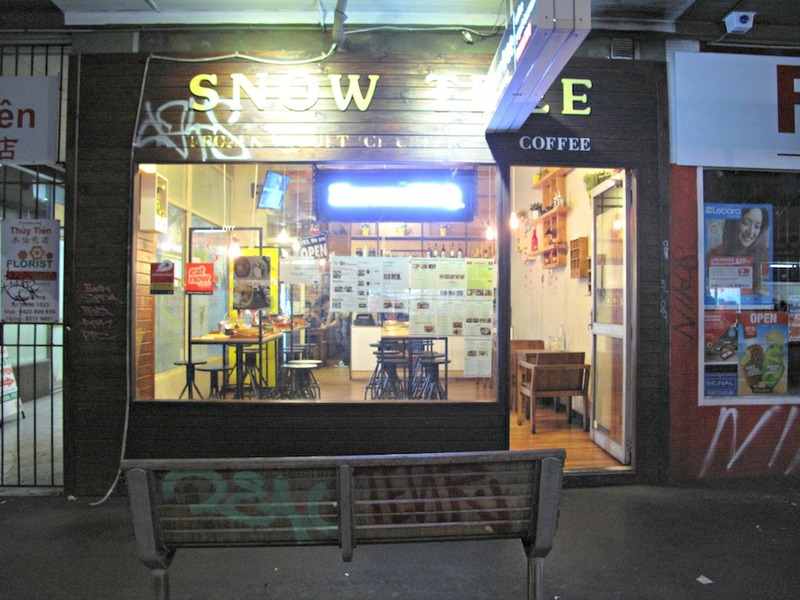 All minor quibbles aside, we enjoy our time at Snow Tree. 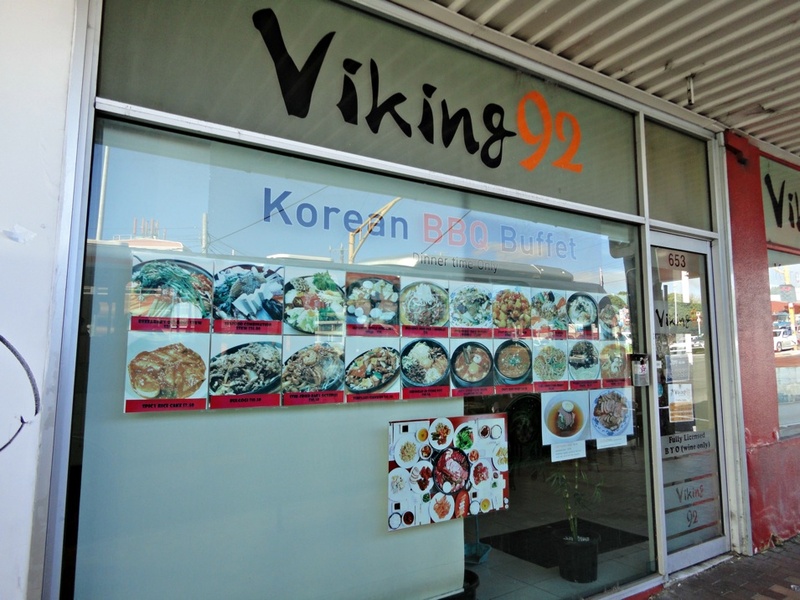 It strikes us as a winning Footscray spot for Korean food that can cater for a quick ten-buck solo lunch or for more relaxed meals for larger groups. 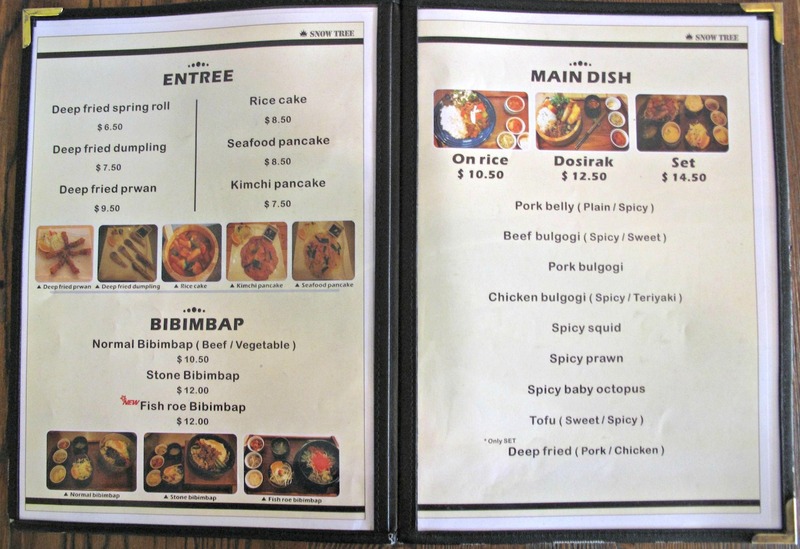 And the menu is comprehensive! 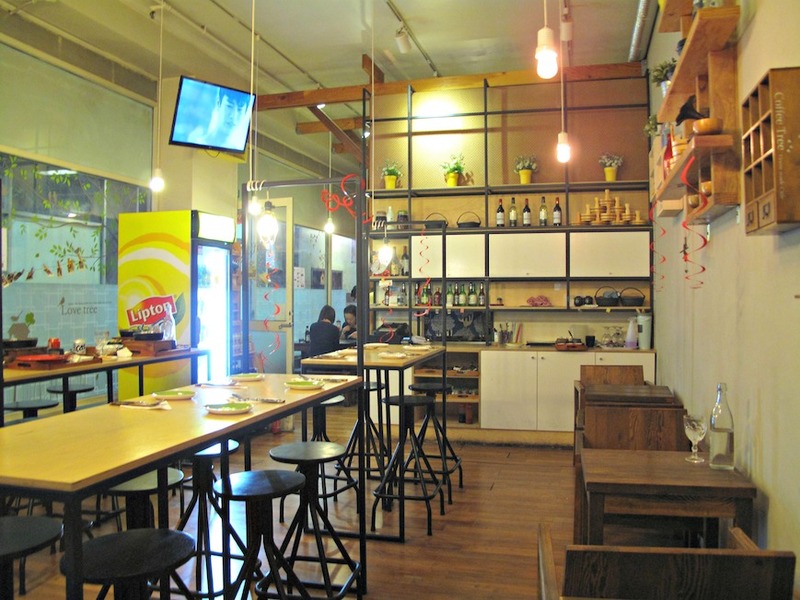 Frying Colours does Korean food with an upbeat, swish attitude. 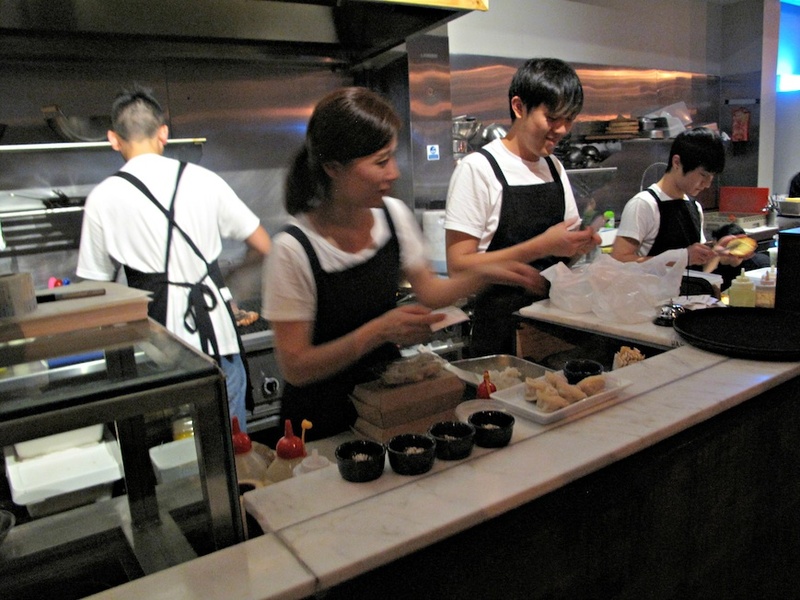 The long room, which formerly housed a noodle shop, has undergone a substantial refit that cleverly combines a hip suaveness and the feel of a more traditional Korean cafe, especially thanks to the old-school wooden tables. On a Friday night, the place is humming. The staff are everywhere and very good at their jobs. The open kitchen/servery takes about a third of the space. We’re very happy that our food arrives in approximately the same amount of time it takes us to work what we are going to order – bravo! For tonight, Team CTS numbers four, so we expect to make merry with the menu. Everything we have is good. There’s a couple of major hits and a minor mis-step that has more to do with our ordering than the food. Just for fun and to experience as much of what’s available as we can, we order a couple of skewered starters. 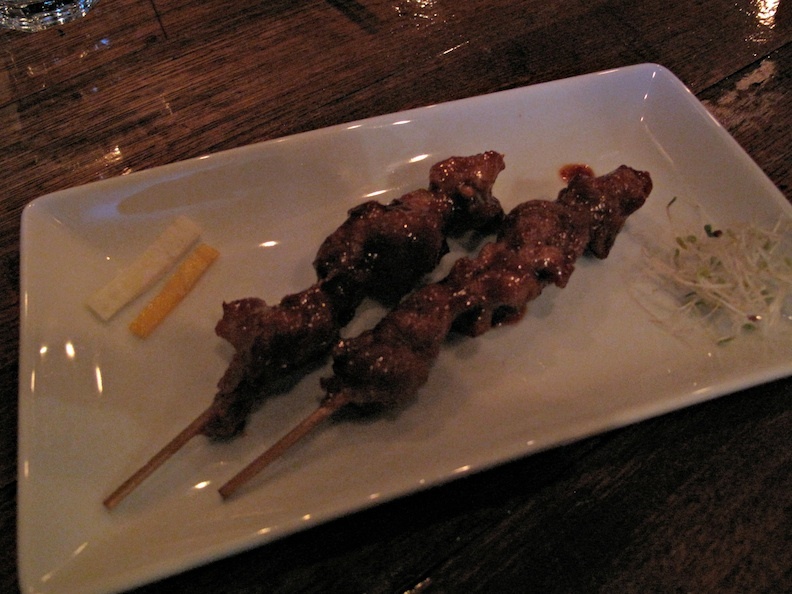 “Mouth-watering chicken skewers” ($3 each) are good in a kind of Korean satay fashion. 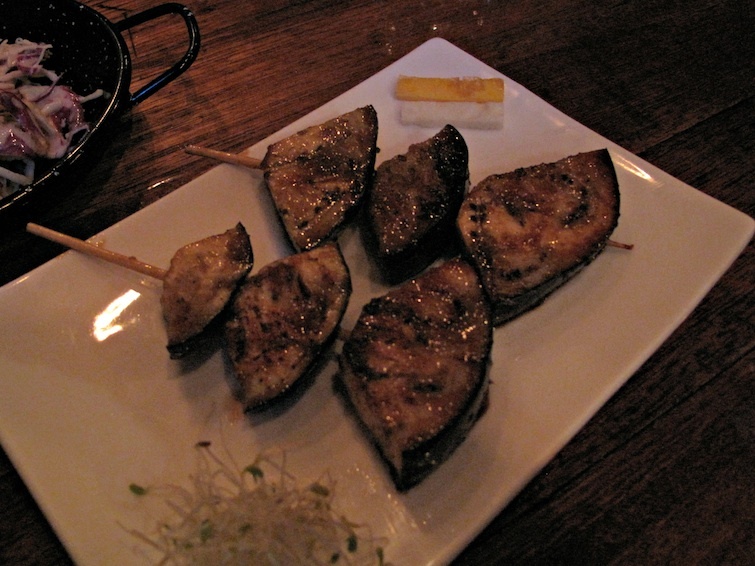 Eggplant skewers ($3) are way better – they’re tender, juicy and with immense smoky eggplant flavour. We’ll be ordering a stack of these next time. We order a whole fried chicken. They’re $32; $19 for half. There’s something enormously liberating and reckless about ordering a whole fried chook – or the equivalent bits there-of. We split our order 50/50 between “spicy” and “sweet soy” (there’s also “original” available). Our selections turn our expectations upside down. Expecting the sweet soy pieces to be the more moist, we find them instead to be the most like orthodox fried chicken. They’re fab. The “spicy” pieces, by contrast, are moist with a glaze that seems almost Chinese. The spice levels are modest for this table-full of western heat hounds. But still, this is great stuff and the other big hit of the night. We’d do it again in a flash. We’ve accesoried with “wasabislaw” ($5) and kimchi ($5). Both are good and well-priced for the serve sizes. 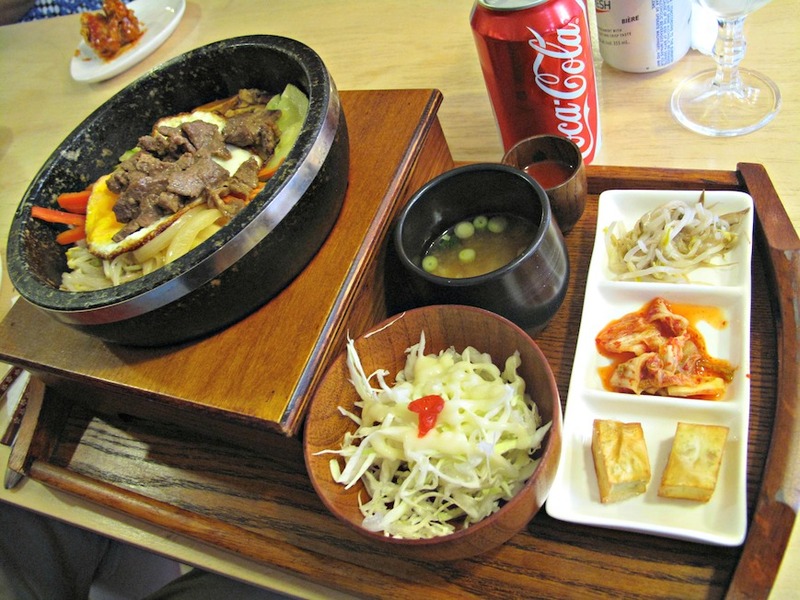 Bulgogi hot pot ($36) is one of a handful of dishes to share. 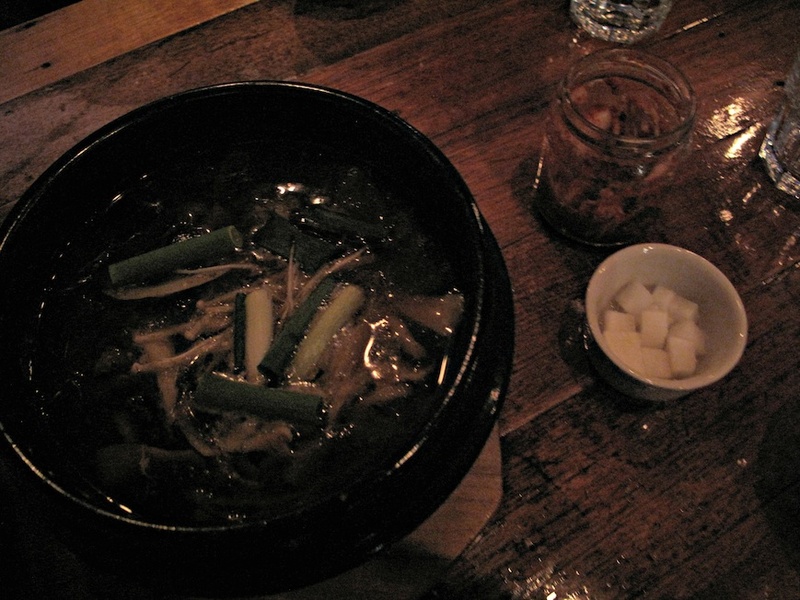 It’s of a more traditional Korean bent, with sweetish stocky broth, sliced beef, two kinds of onion, heaps of glassy noddles and some nice slithery mushrooms. It’s nice enough but is, we suspect, not really what this place is all about or well worth visiting for. 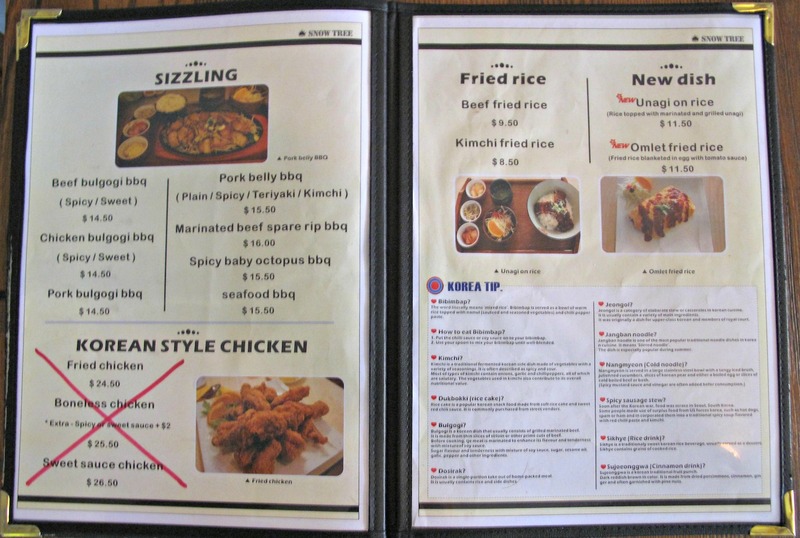 We reckon stuff such as the fried chicken or the “FC mixed grill” to share ($40) are the go here. On the way home, we make a West Foostray stop for peanut butter and vanilla ice-cream courtesy of tonight’s dining companions. They’re both so very, very fine. The ice-cream AND the companions. Check out the Frying Colours website, including menu, here. Punctuality – and even rampant earliness – is a Weir family trait. So we get to the Harlequin rugby home ground in Ashwood/Chadstone quite a bit too early for this morning’s game. Early enough, in fact, to set off on foot to the nearby retail strip is search of coffee/hot chocolate. I’m not particularly hopeful – the area, when we passed it earlier, seemed drab and devoid of interest, the primary fact of the place being the endless stream of traffic in both directions on busy Warrigal Rd. 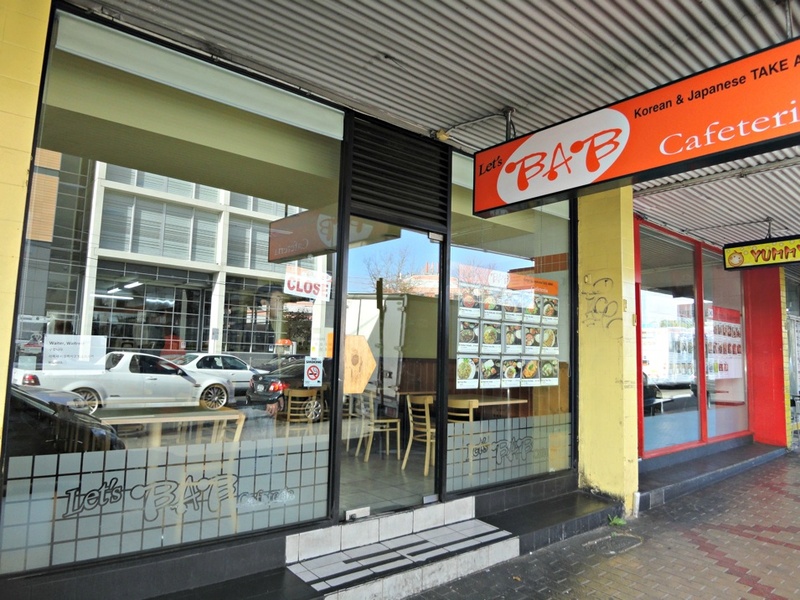 We find coffee – just barely acceptable from a dowdy bakery. We find something else, too, something that eluded us in car but that becomes readily apparent on foot. 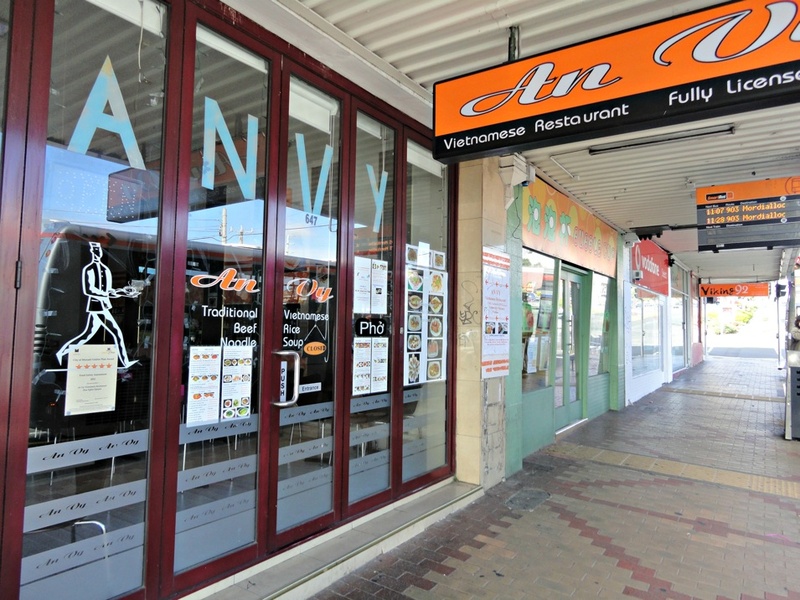 This stretch of Warrigal Rd is an area of intense food activity. 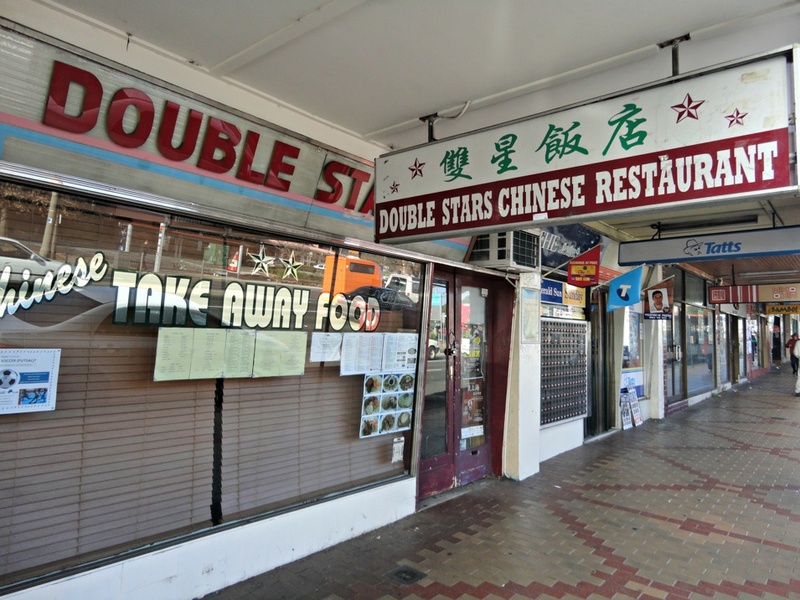 In fact, there eight Asian eateries crammed into barely 200 metres. Several of them are Korean. But there’s a bog standard Chinese, a Vietnamese and an Indonesian place, too. 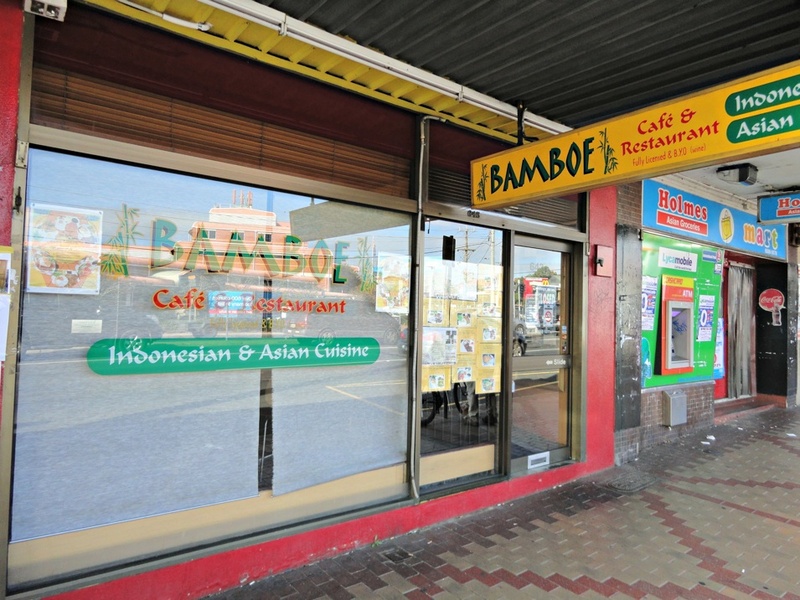 That latter, Bamboe Cafe, appears to offer a substantial and intriguing list of variations on nasi goreng. Of course, at 8.30am on a Saturday morning none of them are open. And the chances of us ever being in the vicinity when they are seem slim. But in Melbourne … you never know.